If you have noticed the recent lack of posts, I apologize. Hopefully you will understand that this has been one of the best months for fly fishing that east Tennessee has to offer. I've been fishing all over, from the Clinch and Holston Rivers near Knoxville, to the Caney Fork River in Middle Tennessee. Smallmouth bass streams on the Plateau needed to be explored, and all of this was happening in between the majority of my guiding which is in the Great Smoky Mountains National Park. Thankfully I can report that fishing has been good to excellent depending on the day. 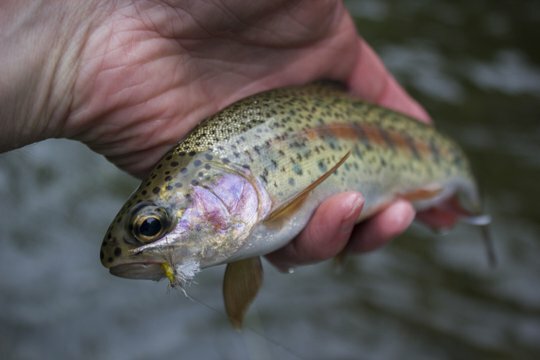 Hatches in the Smokies have been diverse with lots of bugs on the water at times. This has resulted in a happy guide and happy anglers! One thing new that has happened recently is that I entered the world of Instagram. That is right. You can go find me on Instagram. My Trout Zone Anglers Instagram is simply @TroutZoneAnglers. Following me there and over at both Trout Zone Anglers and the Trout Zone on Facebook will keep you more in the loop as to what is going on. The month of June is already booking up very quickly. I still have a few dates available including a Smoky Mountain trip on Thursday of this week and Monday of next week. If you want to fish with me this month or next, please book as soon as possible to guarantee your spot. This year it looks like business will be very busy and as much as I hate to turn people away, that is what I'll often have to do when contacted just a few days prior to a hoped for trip. One other great way to stay in touch with what I'm doing is to check out the Trout Zone Anglers newsletter. That is a link to the newsletter from early May, but a new one will be coming out in the next few days. To make sure that you don't miss out, use the signup below. Fly fishing is a science or an art form depending on who you talk to. Many, including myself, will even gladly label it as both. The true pinnacle of both the science and the art is found in match the hatch dry fly fishing. 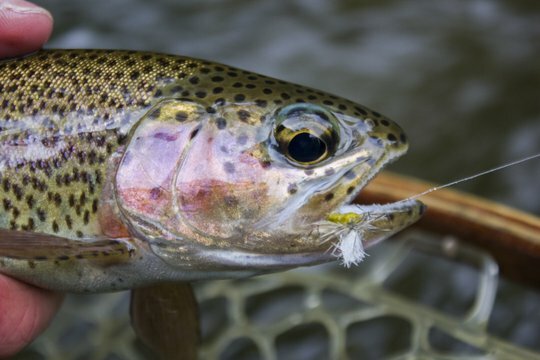 Most good fly anglers have a favorite hatch, especially those who are blessed to reside in a region with rich trout waters supporting a variety of quality hatches to fish. 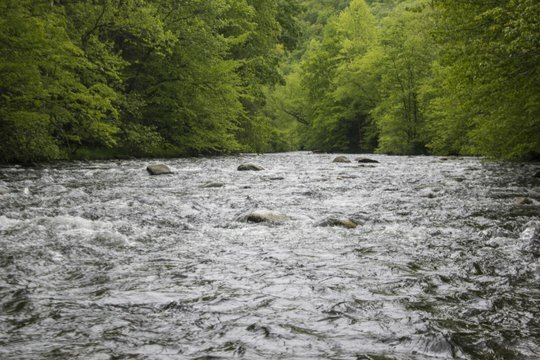 Many anglers here in east Tennessee have a favorite hatch, but just as many don't want to hem themselves in. This is a product of our relatively infertile mountain streams where a truly memorable blanket hatch is rare although not impossible. Local anglers often gravitate towards generic patterns that resemble of variety of currently hatching bugs. Our hatches tend to be sparse but complex, with sometimes as many as 5 species of mayflies hatching, not to mention the caddis and stoneflies that the fish also love to eat. I'll never forget the first time I got on a real hatch. Back in 2005 I was blessed to spend time fly fishing in Yellowstone for the first time. I arrived in early June for a week or two of exploring and fishing. My timing could not have been better. The Firehole was just about perfect while the Gibbon was still a tad high but readily fishable. The first day I headed to the Firehole, I did not really know what to expect. The week or so prior to my trip had been spent tying Blue-winged Olive and Pale Morning Dun Sparkle Duns, two simply elegant flies that still find an honored place in my boxes. I wasn't sure if the hatch would come off, but all of the guide books recommended being prepared for these hatches and the Sparkle Duns were high on the list of accepted patterns for matching the hatches. The Firehole had rising trout in the first place I stopped, somewhere in the first 2-3 miles above the canyon stretch. I quickly tied on a PMD Sparkle Dun and began targeting risers. As it turned out, catching the fish proved relatively easy so long as I could make an accurate cast and prevent drag. That last item was not as easy. 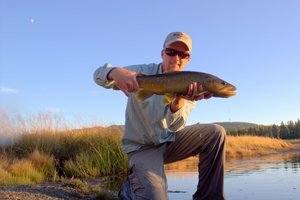 I caught more quality brown trout than is probably fair for anyone to enjoy. 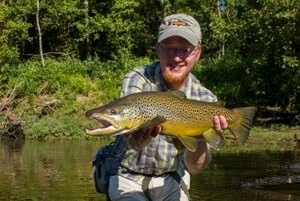 At the time, I was thrilled to be catching 8-14 inch browns all day. For that matter, I would still take that kind of fishing now. That trip to Yellowstone quickly fell into an easy routine. Breakfast every morning would be attended by a family of ground squirrels who were hoping for some of the Honey Nut Cheerios I enjoyed. Then it was off for fishing, mostly on the Firehole or Gibbon, but I also explored some of the hike in lakes. Getting spoiled without knowing it, I eventually found it necessary to head for home. Although a piece of me would have preferred to stay in Yellowstone indefinitely, duty called, and I had to get a summer job to help pay for college in the fall. Arriving back in Tennessee, I soon found myself missing the daily hatches and rising trout on the Firehole. 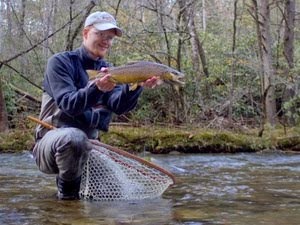 It wasn't until several years later, perhaps four or five, that I enjoyed a great hatch on my home waters in the Smokies. 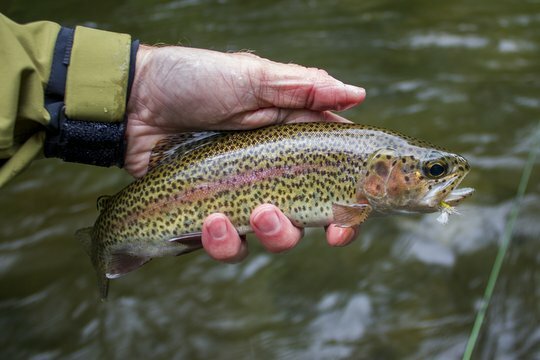 That is not to say that I never experienced hatches or rising trout because I enjoyed both, but a heavy hatch is somewhat unusual around here. Despite my appreciation for heavy blanket hatches of mayflies, I think I've come to prefer those that are sparse instead of those rare events where the water is covered in bugs. The fish seem to be much more willing to rise to most anything during these hatches we normally experience here in southern Appalachia. That is part of the charm. Each year, my favorite dry fly seems to vary a bit. Some years it will be a Yellow Stimulator in size #14 or #16. Other years it may be a Parachute Adams. This year, I've been on a yellow Parachute Adams kick. Early on, of course, I stayed with the darker colors of a standard Parachute Adams, sometime switching out for a Spundun or even a tiny Blue-winged Olive Parachute for particularly picky trout. Yes, difficult fish do exist here, but they tend to be easier to figure out than the fish on streams like the Paradise Valley Spring Creeks where anglers have been known to reach madness or the next thing to it while trying to figure out a difficult trout. Lately, with the transition to the lighter colored bugs of late spring and summer, I kept it a bit more simple than I sometimes do. Instead of elaborate bugs with perfect hair wings and shucks of Zelon, I've kept the Parachute Adams theme going but changed the body color to yellow. The fish approve heartily, but have also rose just as convincingly to a Parachute Sulfur and a Parachute Light Cahill. Like I said, the general idea is more important than the exact bug. 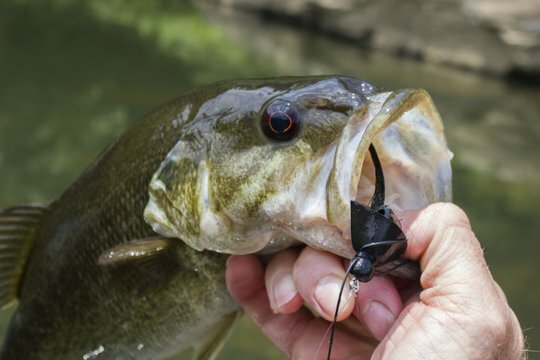 The best days for bugs happen to be the same days that most anglers prefer to not go fishing. 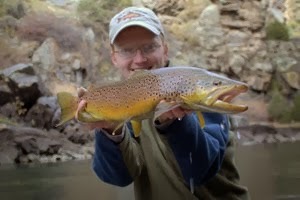 Rain or high water keeps the streams open, and if you are adventurous like me, expect some great fishing. 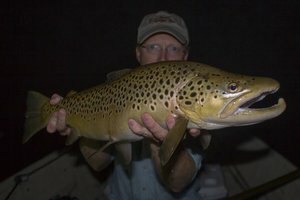 Last week, I enjoyed one evening after work where I stood in one spot and caught 8 or 10 fine trout before deciding that it was time to quit. Most were rainbows, but a few of the fish that got away flashed golden brown. One little brown couldn't quite throw the hook before I landed it, but otherwise all the fish were feisty rainbows from 8-11 inches in length. There were just enough natural bugs on the water to get the fish looking up, but not so many that they would miss my imitation as it bobbed downstream in the choppy current. That is a good hatch if you ask me. 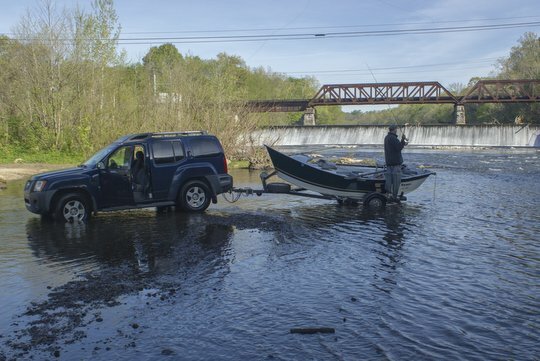 When two fly fishing guides with busy schedules plan an intentional guides' day off, you never know what is going to happen. When not taking clients fishing, we are just as likely to spend a whole day experimenting to just to try some new flies or tactics or maybe mess with some fish we don't target as often as the usual trout. The day before our planned excursion, David Perry of Southeastern Fly and I were discussing where to fish and several options came up. None were on the current "hot" sections of our favorite rivers to guide for trout, but that was intentional. Sometimes these exploratory trips turn out well and sometimes they are a bust, at least as far as catching a lot of fish goes. The one thing that is always guaranteed when you fish with friends? A good time. It is not just about catching fish after all. 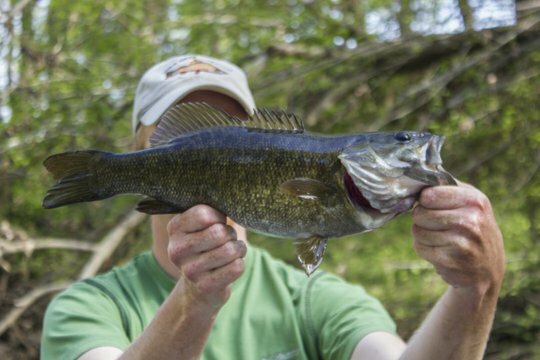 We finally settled on a game plan that involved smallmouth bass, always a good choice. Arriving at the river, David decided to back his boat way out in the middle of the river, mainly because the edges were simply too shallow for the boat to float. That would be a theme for the day. If the river had been another 100-200 cfs lower we might not have made it down. The fish didn't mind though. I caught several small redeye bass in quick succession despite David P. not catching any fish from the boat trailer, so it was determined to go ahead with our game plan and off we went. Floating along, we found a few redeye and briefly hooked up with a smallmouth or two, but it was obvious that a strategy change was in order. Thankfully, David P. brought the hot fly tied by smallmouth angler extraordinaire Gary Troutman (what a great fishing name right?). After some discussion now how to fish said fly, David P. stepped into the casting brace and started working the magic fly. As a good guide, I was incredibly oblivious gazing at the scenery so I could point out interesting things to the guy in the front of the boat. Thankfully he was focused on the task at hand and when the fish hit he was ready. After a solid fight, the first nice smallmouth came to the net and we took a much deserved picture. Insisting that David P. keep fishing for a while, I eventually lost my reluctance to leave the oars when a great hole with lots of structure came into view. I grabbed a heavy rod rigged for musky and started flailing the water. That produced a maybe follow. A maybe follow is when the angler thinks they see a fish but it could just as easily be the product of an overactive imagination. Despite my optimism, no other fish showed so it was back to smallmouth. In due time, I found my first nice smallie. We continued the day, taking turns fishing and getting a fish here and there. The pinnacle of the day came unexpectedly. Having caught the last nice fish, I was deservedly on the oars while David P. kept looking for another good fish. We had already drifted down several exceptionally shallow shoals, but the boat was still in one piece. As we approached another obstacle, this one a huge tree laying across the river, David P. turned around and with a completely straight face told me to go left. I looked at him in disbelief. No way was I going to try to take the boat left but I did manage to blurt out a "I would like to see you row that." Not one to back off from a challenge, he told me to switch spots. I got into the front of the boat while he grabbed the oars. On further examination, he told me I was right made the prudent decision to not try getting over the tree. Just as I started breathing normally again in relief, David P. told me to go ahead and fish since I was in the front of the boat. Not one to argue when the option to fish presents itself, I cast the hot fly into the run we were drifting past. The fly barely hit the water before getting slammed. After just finishing a long fishless stretch as the angler, the guy at the oars was a little shocked. I was glad to have snatched what should have been his fish but also felt a little guilty. After the pictures ,which he still graciously took for me, I tentatively offered, "You want me to row so you can fish again?" His answer was an unequivocal yes and brought no argument from me. That big smallmouth made the day for me, and I was content. The rest of the float was anticlimactic. Despite our hopes, we only saw one or two more muskie and the smallmouth seemed mostly uninterested. The scenery was nice though as was the time with a good fishing buddy. We had set out to catch a few fish and have a good time and succeeded on both counts. 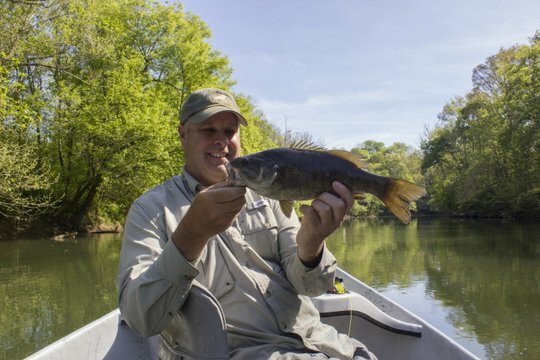 Floating for smallmouth is tough now with low water, but wade fishing for them is just picking up. 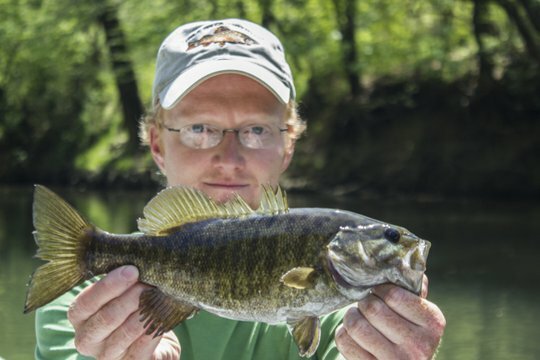 If I can help you with a guided fly fishing trip on the Cumberland Plateau for smallmouth bass, please contact me via call or text at 931-261-1884 or email me at TroutZoneAnglers@gmail.com.